We offer you the full range of Rembrandt colors in open stock. Rembrandt pastels are made from the purest pigments and mixed with the finest quality kaolin clay binder. No pigments containing heavy metals, such as cadmium, lead, and cobalt, are used in production which ensures that the pastels have no hard bits or sharp edges. These pastels are harder in consistency than many soft pastels, allowing for more control and definition in your painting. Full sticks measure 2-3/4" long × 7/16" diameter (70 mm × 11 mm). They are paper wrapped, and are sold individually. Half sticks are available only in sets. 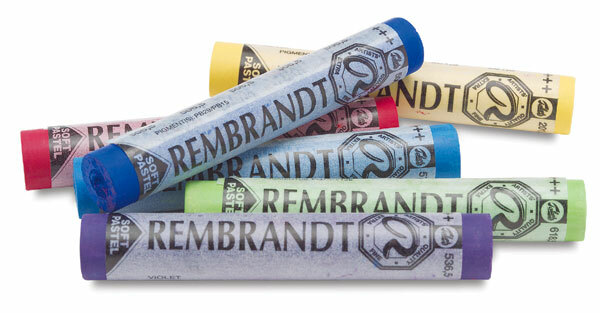 Gift Idea — Rembrandt Soft Pastels are available in a variety of attractively packaged sets, from economical half stick sets to the exquisitely packaged wooden box sets. See Rembrandt Soft Pastel Sets for pictures and more detailed specifications of these sets.